As I mentioned in an earlier post I had two clients ask if I could print photos on-site so that the attendees would have something to take home, kinda like a party favor. I did some research and found it to be more affordable than I initially thought. So, I ordered a couple printers and decided to give it a shot. So far I’ve had two opportunities to put this system to use, and I’ve had great success with it both times. This tutorial describes my setup, workflow, and what I’ve learned along the way. I needed a printer that could deliver photo-quality prints quickly and affordably. My research immediately pointed me to dye sublimation printers. They use an altogether different technology than inkjet or laser printers. As far as I can tell, it’s the same technology they use in the self-service photo printers at CVS, Wal-Mart, Kinko’s etc. Additionally, I needed something that could print straight from a memory card and from a computer. I landed on the Selphy CP760 by Canon. It’s a compact photo printer, it met my requirements, and it’s only a hundred bucks. I knew I would have a pretty demanding output volume, certainly higher than the average consumer, so I ordered two of them. Given that I had never used a printer like this before, I did a few test shots and test prints to see how everything flowed. The printer is super simple to use. Pop in a memory card, the images show up on the small playback screen, tell it how many copies you want of each, and then hit print. The quality is exactly what I needed to. First of all, set your camera to shoot “RAW + Jpeg.” Most printers cannot read RAW files. Lightroom, on the other hand, works better with RAW files, so be sure that the option to “Treat jpeg files next to raw files as separate photos” is unchecked in the Import Preferences dialog box in Lightroom. Another invaluable asset is the DPOF option in most digital cameras. Digital Print Order Format allows you to setup a run sheet for the printer. Within the camera you make note of which pictures to print and how many. That information is then saved to the memory card and read by the printer. The printer then says, “Hey, I see that there is a print order file on here, do you want me to print these?” (paraphrased, mind you). Simply hit the print button and you’re in business. Check your camera’s instruction manual for information about DPOF. Next, you’ll want to install the printer on your computer so you can print directly from Lightroom. Fortunately I had no problems with this whatsoever. I installed it first on my PC at home, and then on a MacBook for the events. The printer ships with a CD-ROM that includes drivers for both operating systems, so you can be up and running in no time. The most important thing to keep in mind is that you will have to setup the printer preferences in Lightroom so that it will print properly on the 4×6 postcard size paper. Printing from a computer provides some advantages that you can’t obtain by printing from the memory card, but it also contains some disadvantages. Here’s a look at them. You can print edited photos. It’s easier to find a specific photo. The photos must be imported and exported before printing starts (ie. it’s more time consuming). You can only use one printer unless you have a second computer. 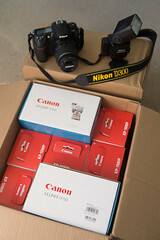 Whether you decide to print mainly from the computer or memory cards will largely be determined by your equipment setup. In either case I suggest you follow this principle: Use the DPOF for what it does best –printing pictures quickly. Use the computer for what it does best –printing edited pictures and printing photos per request. General Workflow: Set DPOF as you’re shooting and then print on the standalone printer first. After the photos have been printed, upload them to the computer. Review the photos and note any ones that need to be edited and re-printed, or any ones that will likely need extra copies. Add those photos to the Quick Collection in Lightroom. If you need to start another batch while the standalone printer is busy, then go ahead and print DPOF from the second printer. Try not to let the re-prints sit in Lightroom too long before they are printed. Clear the DPOF info from the memory card next time you insert it in the camera, otherwise you’ll end up printing multiple copies of the same photos. Lightroom Workflow: Import the RAW photos directly from the memory card. In other words, don’t copy them as DNG files; doing so will only slow down your pipeline. Remember, speed is paramount when printing on-site. Add to the Quick Collection* any photos that need to be edited or have extra copies made. The QC then serves as your printer queue. 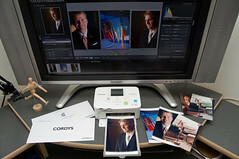 View the QC and edit the photos as necessary; create virtual copies for any photos that need additional prints. Then switch to the Print Module, select all the photos and click print. *Simply select a photo and press “b” to add it to the QC. Adapt your workflow to your setup and your delivery requirements. There is no “one size fits all” approach to printing on-site. Prior to the shoot, gather as much information about the event as you can, and then use that information to decide the best way to handle things. The decision to hire an assistant is based largely on the nature of the event. As a general rule, if the client is okay with you devoting 1/3 of your time to making prints, and therefore only 2/3 of your time taking photographs, then you can handle the printing yourself. If the client requires that you are available to take photos the entire time, then you’ll need an assistant. You’ll need to charge more if you hire an assistant, so make sure you give the client an overt benefit for having one –more prints, faster, and more coverage. Test your ISO settings on the printer. Shoot a series of photos in a darkish room and increase the ISO each time until it’s maxed out. Next, print them and decide what is an acceptable level of noise for printing. Test the Image Optimization settings in the printer. Print a photo with it turned on and a second with it turned off. Which do you like better? If you need to get your feet wet first, try printing some photos at a house party for your friends. It’s a fun way to get some experience under your belt without the pressure of having a job to do. For the hospitable folks out there, why not host a party for that very reason. Besides, once your friends see what you can do, they’re much more inclined to tell other people about you, and that’s how you land a job. As a bonus, anything you buy for the party is a business expense! For an extra touch of class, print envelopes with the client logo on it. The envelopes will help protect the pictures, as well as serve as an advertising tool for you. While shooting, just be a photographer. Don’t get bogged down thinking about all the printing stuff. Stay creative and professional. Distance yourself from the customer while printing; a separate room is ideal. If you give them a chance to see you working they will invite themselves to look over your shoulder and become your artistic director. Take extra care to make sure you’re getting good pictures of people. If someone sees you take a picture of them, they will expect a print. They will also expect the photo to be in focus, well lit, and a perfect expression on their face. If any of those factors are missing, take another shot and print the best one. The guests can lose confidence pretty quickly if they see other photos printed but not theirs. Both the printer and the ink/paper are available at several local stores. Try checking out Penn Camera, Staples, Best Buy, or Target and save yourself $50 on overnight shipping. …yeah, that would’ve been nice to know. Set DPOF information in the camera as you’re shooting, particularly for those times when you take multiple versions of the same thing. Pick the best one and set the DPOF. Don’t forget to pack: a screwdriver (or something comparable) for winding the cartridge/ribbon, power strip and extension cord, USB cable for computer-to-printer, and a memory card reader for the computer. 1.) Prints will be available approximately __ minutes after it was taken. 2.) Please take an envelope to protect your photos. 3.) Re-prints and extra copies (no more than five) can be printed once the current batch is finished. 4.) Photos can be brightened, darkened, cropped, and color-corrected upon request. 1.) Use a cell phone headset or 2-way radio to communicate with assistant. 2.) When dropping off a memory card to be printed, let the her know if there are any photos that need to be edited before printing. She will decide if those specific photos should be uploaded or printed first. 3.) Use this Printing Checklist to note which memory cards have been printed and uploaded, and at what time. It takes a little over one minute to print a photo, and if you do the math you should be able to print 100 photos per hour (using two printers). Practically speaking, it will probably be substantially less than that. Between the two events I shot, I averaged only 41 prints an hour. I know there are some things I can do to streamline it further, but I don’t think you could reasonably get more than 65 prints an hour with this setup. I was able to print DPOF straight from the memory card even while the computer was attached. The instruction manual says not to do this, but I did it on a MacBook and didn’t experience any problems. Lifespan of printers has not been determined as of this writing. I’ve printed 468 photos between the two printers without a single mishap. For much bigger jobs, a high-end printer would be preferred though it comes at a price. Conclusion: On-site printing can be very demanding. Without a good workflow it’s easy to get overwhelmed. The guests/customers/attendees will test your patience if you let them. Make sure you’ve done a few small tests before the shoot and do your best to take everything in stride. It’s extremely rewarding to hear people comment that they like the photos, but it takes a lot of hard work to get there. This entry was posted in Teaching, Tutorials, Work by Stephen Elliot. Bookmark the permalink. Sorry to hear your experience was so hectic. It was a huge undertaking for anyone though, experienced or otherwise. You still get some mad props in my book! Thanks for dropping by as usual, Mariano! I know it’s a bit different from the usual findings on here, but I hope somebody can benefit from it. Interesting tutorial, even for your non-photog readers. This is six year old. Any chance for a tutorial that reflects 2014 advances in technology? I don’t do on-site printing any more, so this is all I’ve got.